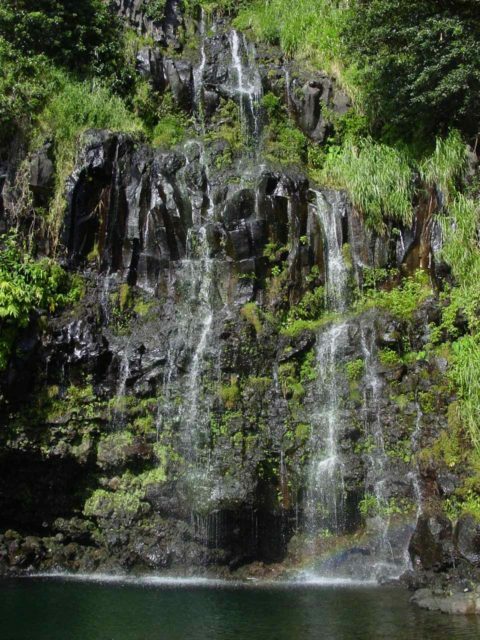 The Blue Pool (also known by its Hawaiian name as Heleleikeoha Falls or Helele’ike’oha Falls as well as Blue Angel Falls) could very well be one of the more scenically located swimming hole waterfalls that we’ve seen. 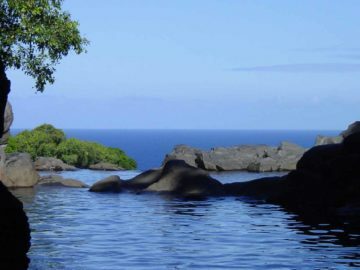 It faces the ocean as it’s sheltered from the crashing waves by rocks protecting its picturesque plunge pool. 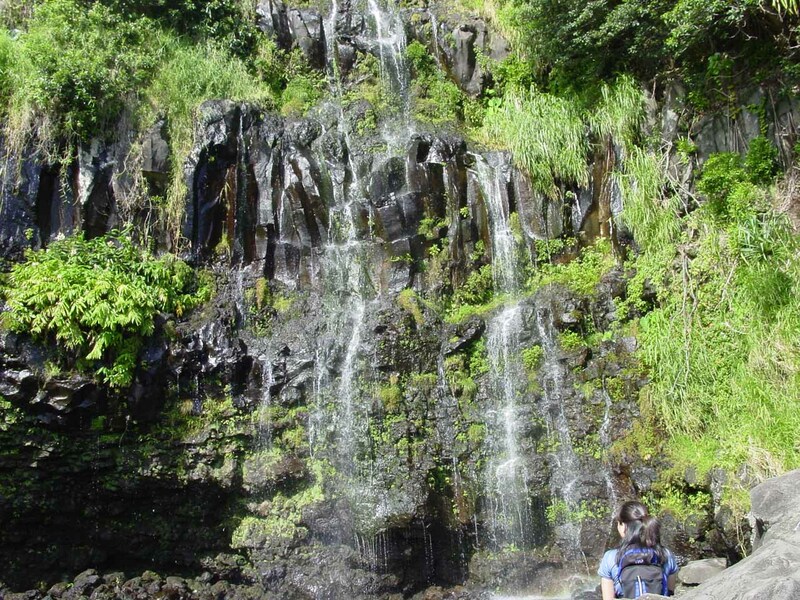 When we first visited it back in 2003, it definitely left an impression on us as it was the first time we had encountered a waterfall like this where scenery, swimming, and serenity were all mixed together in this most sacred of spots. If there was ever a place you could take a dip and contemplate the beauty of where you’re at, we thought this was it! During that first visit, we observed the falls in a light-flowing state, which I’d imagine would be the its typically condition. That said, we happened to see the falls just two days after a rain storm from the remnants of a hurricane. So I’d imagine any higher flow than this would probably render it in a more flooded state (and thus be unsafe for swimming). We were able to walk to the falls after parking in someone’s yard who had converted it into a car park for a nominal fee. From there, we walked to the end of the road, then along the rocks on the stream banks of an inlet before crossing over the stream where more whiter rocks were separating the inlet from the crashing waves. If the stream were to be swollen or if the waves were really raging, I would consider this part of the scramble dangerous. The scramble then persisted along the loose white rocks or boulders for another few minutes before we were right in front of the falls and the pool. Look to the left and there was the nice swimming hole with 100ft (maybe) waterfall. Look to the right and there was the crashing surf. Every once in a while a rogue wave might get us wet even though we were as far away from the surf as we could be. However, I can envision larger rogue waves possibly plucking us back into the tiger shark-infested waters so there’s definitely some element of risk to lingering here. 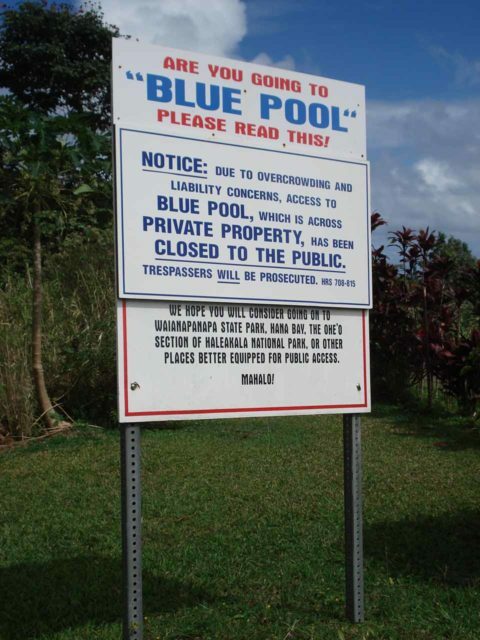 Now in recent memory (seemed like since 2007), the Blue Pool had become a very controversial place. Basically, there were locals who were unhappy with the amount of visitation (including the accompanying litter, pollution, noise, traffic, etc.) and became vigilant about preventing new visitors from coming in. This is where things get dicey (both legally and from a safety standpoint). 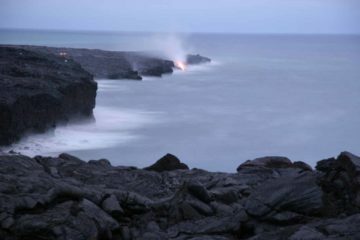 Apparently, the falls is on public land because by Hawaiian law (PASH or Public Access Shoreline Hawaii), no one can own the beaches and shores nor prevent access to them. 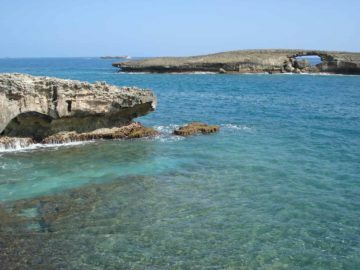 The intent of the law was to prevent a resort from taking a chunk of shoreline (like a beach) hostage and making it exclusive. 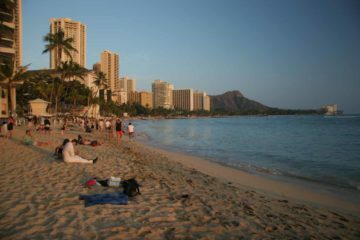 Thankfully, this law has prevented some beaches from being lost to the public, whereas you might see the opposite result in other countries where the resorts were allowed to own the beaches and call the shots. Unfortunately in the case of the Blue Pool, access to the shoreline requires getting through driveways that are privately owned. These residences were not equipped to handle a major tourist attraction (though some of them were offering their front yards as car parks for a fee). So given the current contentious state of affairs, this place is now in a situation where only a privileged few can visit the waterfall (violating PASH), and you can pretty much consider this attraction kapu (forbidden) and expect resistance if you get there. While I can sympathize with the locals unhappy with the popularity of the falls, I personally think they should either run a paying tour or hire staff to run one. Then, the proceeds would go towards the workers as well as the residents for their trouble (assuming the laws and/or economics aren’t so twisted so as to make even this option unpalatable). 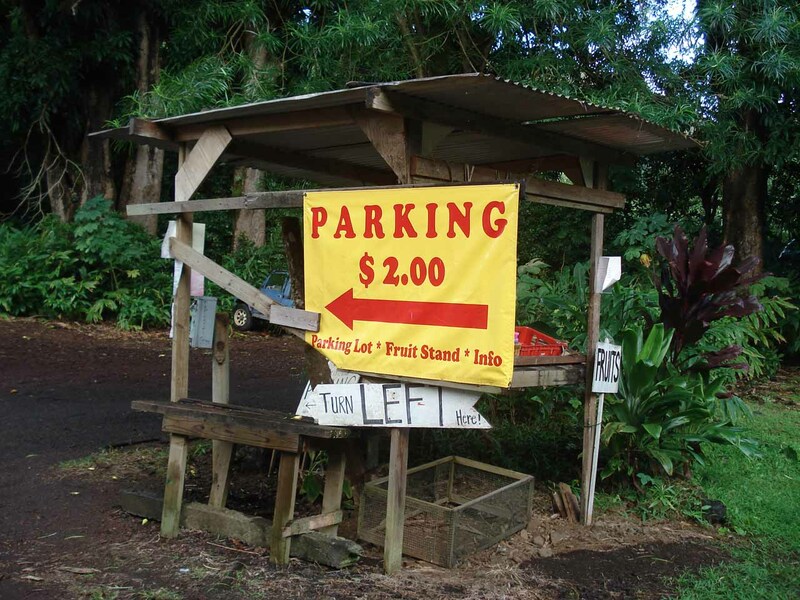 I could even see a tie-in with the Kahanu Garden (roughly half-way between Hana Hwy and the end of the ‘Ula’ino Rd; possibly an opportunity to teach visitors about the area) where maybe parking could be there while only staff can shuttle visitors to and from the Blue Pool. 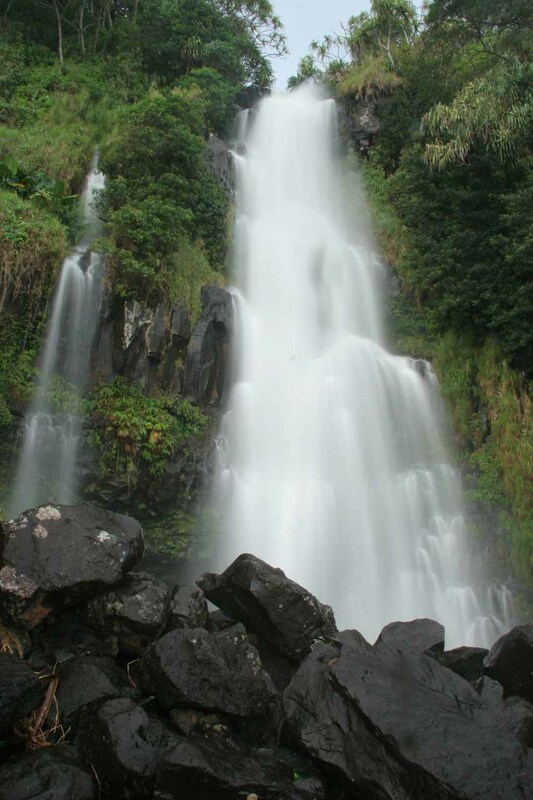 There has been precedence with other Hawaiian waterfalls requiring paid tours. So why not this one? 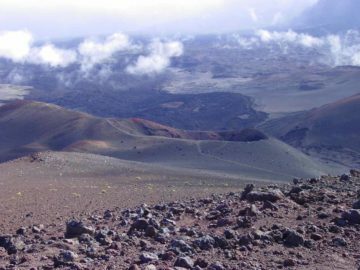 Perhaps that would then return this part of East Maui into a more welcoming place instead of something that’s quite the opposite. And do this while still addressing the issues that concern both locals and tourists (as well as law enforcement and government) alike. Of course, this is just a suggestion, and it’s up to the residents there and the local government to decide how they want to deal with it. To read more about recent experiences by disappointed visitors who felt strongly enough to write about it, I’ve provided a link to the Trip Advisor page of this waterfall. 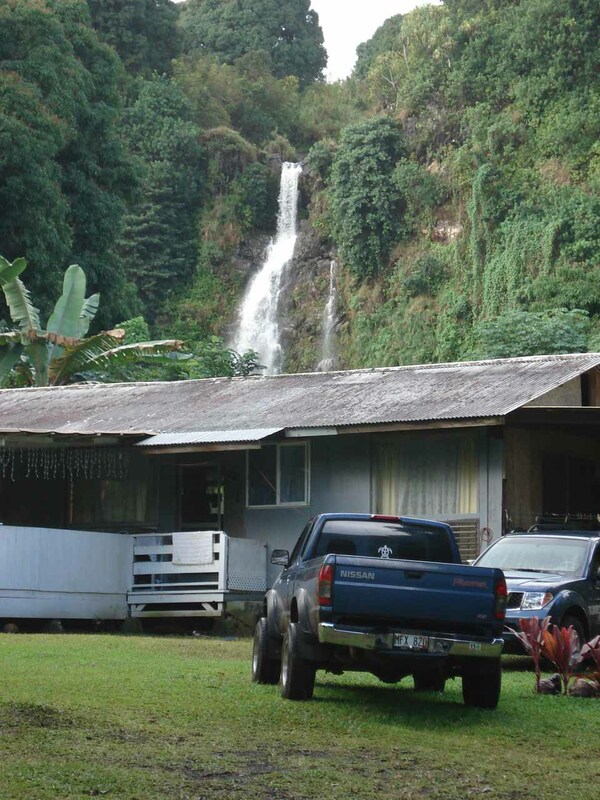 To my knowledge, access to Helele’ike’oha Falls involves crossing through private property. 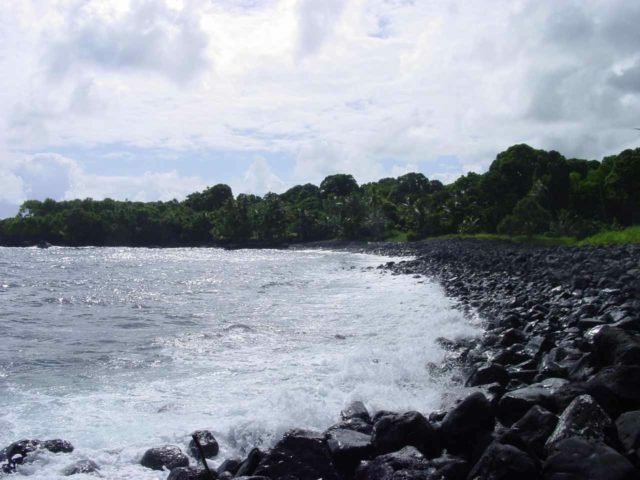 In addition to the links provided already, you may seek out more information or make inquiries about the general area as well as current conditions with the Department of Land and Natural Resources (DLNR). 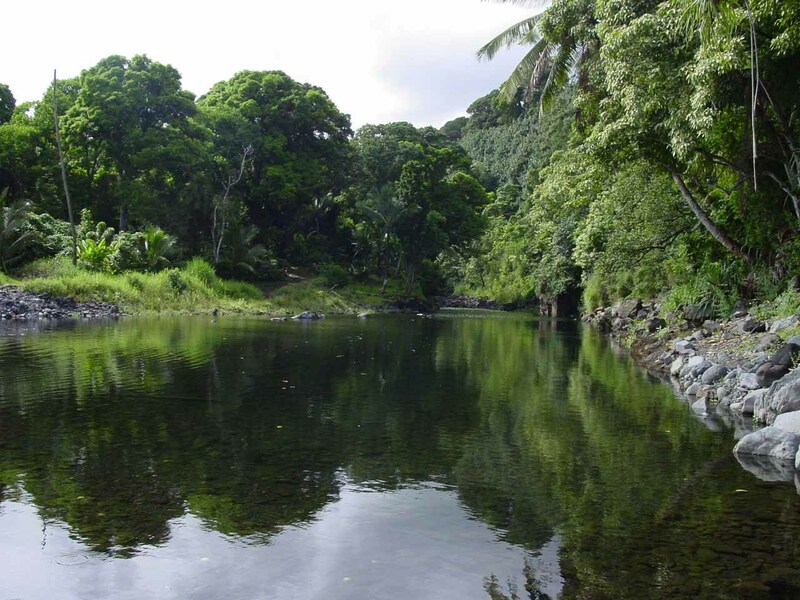 I’ve provided a link to their website Department of Land and Natural Resources (DLNR) here. 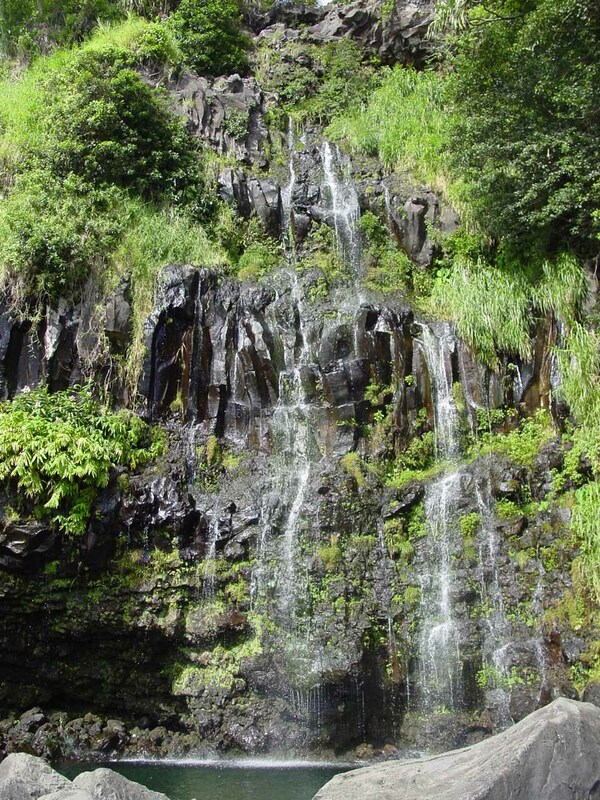 This waterfall is at the end of the ‘Ula’ino Rd off the Hana Hwy near milepost 31. You’ll be greeted with lots of signs discouraging you to continue. There are also two concrete fords to cross, which may be impassable if the streams are swollen from heavy rains or flash floods. 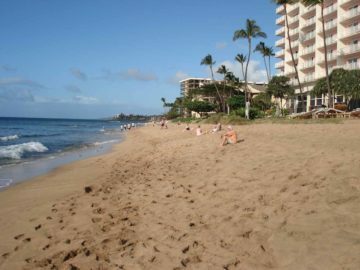 To give you some context, we generally stay on the west side of Maui in either Lahaina or Ka’anapali. The drive from say Lahaina would require us to take Route 30 to Route 380 (taking roughly an hour without traffic). 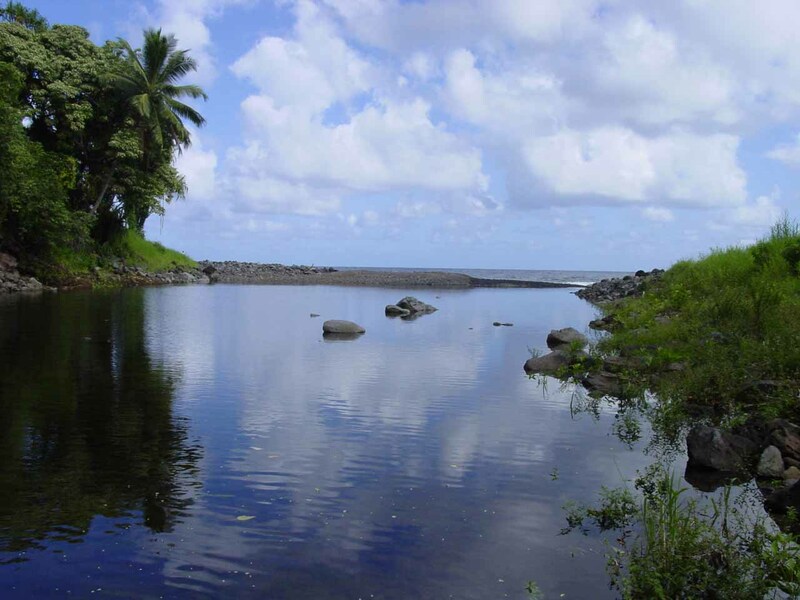 Once we’re near the town of Pa’ia, we’d then be on Hwy 36 (becoming the Road to Hana or Hwy 360). 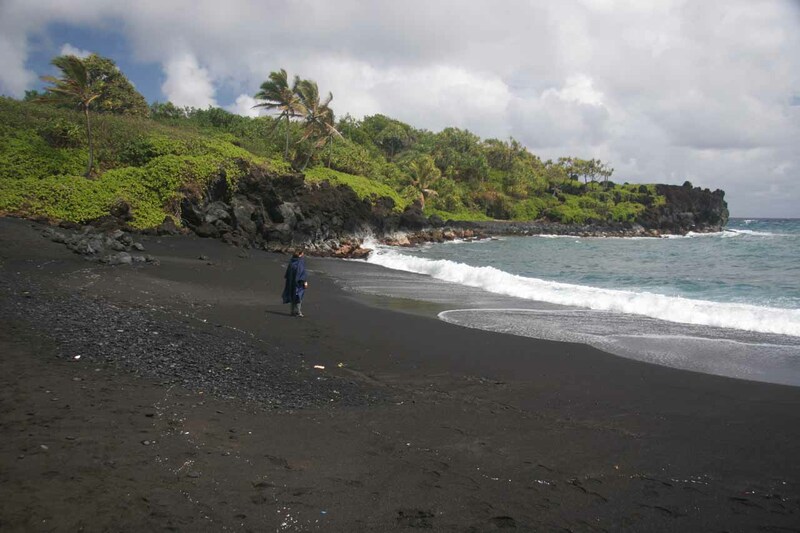 Getting to Hana would take at least 2 hours drive (45 miles) east of Pa’ia. 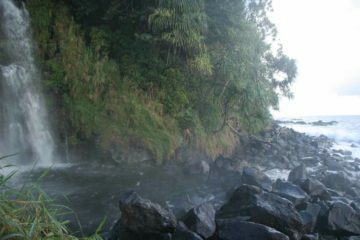 Old movie panning 360 degrees from the Blue Pool showing the falls then the ocean then the falls again.